Picking an internet service provider (ISP) can be a tricky job. Even though quite a few areas don’t have as many competing providers as one would expect, there is usually a number of options to choose from. In order to help you make that choice, this article will provide a quick overview of nine major internet providers so you can get an idea of their offers. It is very important to remember that prices and available services can vary rather drastically by market. Therefore, the figures you see here are subject to change and it is quite possible there will be certain differences due to location. Still, this list provides a good starting point in your search for the optimal ISP. By examining these providers a bit more closely, you are very likely to find a deal which suits your needs. Depending on the area, AT&T offers a combination of DSL and fiber-optic internet. This allows it to provide speeds that range from 5 Mbps to 1,000 Mbps, ensuring it can cover a wide range of user needs. The slowest package costs $40/month while the speediest option will set you back $80 per month. As a bonus, you can reduce these prices with bundles. This provider also has a wide coverage, particularly for its DSL network. However, these packages do include data caps so you need to keep that in mind. Thanks to its fully fiber-optic network, Verizon Fios offers outstanding speeds. The download and upload are symmetrical, which makes this a great choice if you frequently post big files. It has three packages and the slowest one boasts a rather impressive speed of 100 Mbps. The prices go from $39.99 to $79.99 on a monthly level. The downside to Verizon Fios is the availability. You can only get it in select states, although their number is rising. XFINITY promises fast cable internet and it delivers. Its most expensive package, which will set you back $299.95 each month, clocks in at a staggering 2,000 Mbps for both download and upload. Of course, this far exceeds the needs of most users, so the company offers a range of more available options which start at $29.99 a month for a speed of 15Mbps/3 Mbps (download/upload). However, Comcast is notorious for its poor customer service. Although this can be a source of frustration, the company is trying to remedy the problem. Offering speeds that start at 100Mbps for $44.99, this provider sweetens the deal by removing an extremely widespread added fee – the modem charge. In addition, there are options to create bundles with phone and television services for even more value. However, your choices are limited to a certain degree compared to some other providers. CenturyLink is a good choice for users with basic needs as you can get affordable deals. They can also provide nice bundles with DIRECTV and this option is worth considering if you need both services. They also have more advanced offers, although these offers are not widely available. With certain packages, you can even lock in the price, meaning your rate won’t change. In essence, CenturyLink caters to users with budget concerns and provides good value. Of course, this means it doesn’t reach the same heights as some other providers. 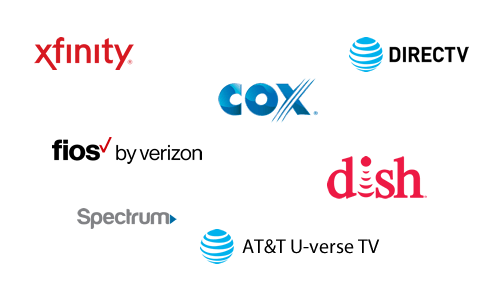 Cox Communications is another provider which offers a very wide range of packages. Starting from a download speed of 10Mbps for $19.99 per month, you can upscale to 1,000Mbps if you are willing to pay $119.99. Upload speeds are a sore spot for Cox Communications. Consequently, even the most expensive package only boasts a speed of 35 Mbps in this regard. Since the average user relies on download a lot more, many won’t mind this. However, it can be an issue depending on your individual needs. Charter Spectrum offers speeds starting at 100 Mbps for a fee of $44.99 a month. In addition, this comes with a couple of welcome bonuses. For one, you get a free modem. Secondly, there is no data cap so you can freely enjoy as many data-intensive activities as you want. And if you have a contract with a different provider, the company will even buy it out under certain circumstances in order to get you to switch. On the downside, there are more affordable options out there. Still, the perks are really nice. HughesNet is a satellite internet provider and it works a bit differently to the previous ISPs. You only have one speed, 25 Mbps, and you choose packages depending on the amount of data you want to have at your disposal with the prices starting at $49.99 per month. Of course, the speed and data limits are an issue, but that is the price of a nationwide coverage. HughesNet is available practically anywhere, including areas where you can’t get DSL, cable, or fiber optic internet. This is the only other major option you have when it comes to satellite internet. Once again, the main draw is the availability. This means Viasat internet is available regardless of your location, which makes it an invaluable option in rural areas. Packages start at $50 per month and the download speeds can even reach 100Mbps, but that depends on satellite coverage. As you can see, it is impossible to give a concrete answer as to the best ISP. That depends on your needs and the providers’ coverage – you cannot get the same service everywhere. Hopefully, you now have a better idea of what to look out for. To find more accurate information, you need to get in touch with any provider which interests you and ask them for the details that are relevant to your exact location.